Whether you’re working in a law office or just trying to make sense of all the paperwork associated with your own legal case, the hardest part of organizing a legal file is often remembering to put everything in it. You’ll need an accordion file to accommodate it all – one with sides that expand as you add documents – and some legal-size file folders. Grab a pen and you’re ready to go. Most lawsuit documents fall into one of three categories: correspondence, court pleadings and discovery. You can use three file folders, one for each, but the devil is in the details. It might be helpful to break up your paperwork into even more subcategories. For example, with your discovery paperwork, you might want a separate file folder for each subpoena you send out and the documentation you receive in response. You can use a separate folder for each litigant’s answers to interrogatories, for police reports if applicable and for deposition transcripts. When you send pleadings -- complaints, motions and other requests -- to the court for filing, place a copy in the pleadings file. Then, when the document comes back from the court stamped as received, toss the first copy and replace it with the official new one. When it comes to a legal file, the magic words are “chronological order.” Within each folder, the most recent documents should be on top, the oldest on the bottom. Remember to label each folder so you don’t have to look inside each to figure out what’s in there. Massachusetts Law Office Management Assistance Program: A New Office – How Should You Organize Your Case Files? Bird, Beverly. 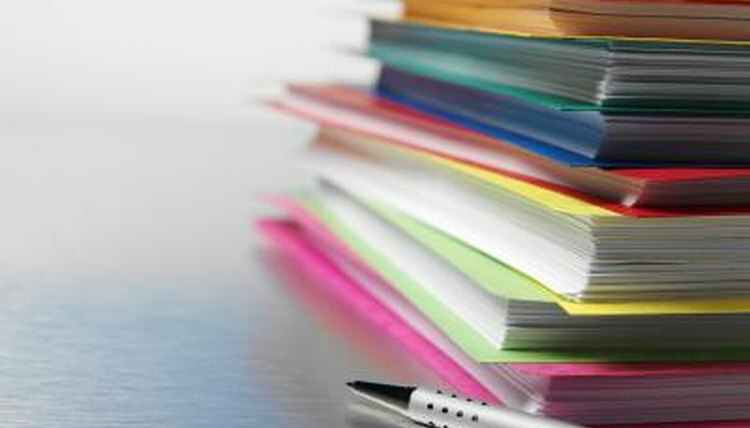 "How to Organize Documents in a Legal File." , https://legalbeagle.com/5979114-organize-documents-legal-file.html. Accessed 18 April 2019.